As a turnaround specialist, Joslyn Simonini spends her days analyzing corporate profit margins and trying to keep her likeness from being turned into a voodoo doll by company employees. If she does her job well, they often lose theirs. So, it comes as a surprise when she finds herself being kissed one day at work. She’s even more shocked to find out that the mysterious kissing bandit is a woman. Not in the habit of kissing women, Joslyn tries to brush off the unintentional mistake. But before long, she’s forced to examine the rush of emotions that accompanied the kiss, especially when she meets Raven Malvolio. At first, she needs Raven to complete her analysis, but she doesn’t expect to need the friendship that Raven offers. When those friendly feelings escalate to something more, Joslyn’s confusion and underdeveloped emotional range might ruin her chance at a relationship that could surpass even her dreams. 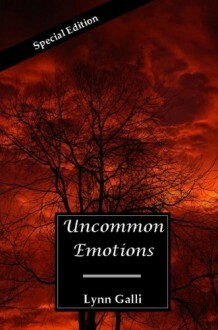 Uncommon Emotions takes a look at how someone can think she’s happy with her life only to be surprised by the passion she’s yet to feel. A pretty standard romance overall, and I'm beginning to get familiar with Galli's writing style and her little jabs of humor. I didn't enjoy it quite as much as Blessed Twice, but still good characters and one I'll likely re-read at some point.